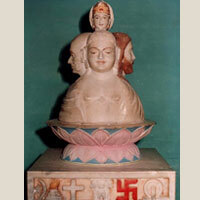 Goddess of non-violence with four heads of Mahavir Swami, Gautam Budha, Jesus Chriest and Mahatma Gandhi. There are also pictures of the great prophets of all religions. Currently a dangerous wave of political and social unrest and upheaval is surging not only in India but almost all over the world, specially among the young generation. The violence seems to be the solution to all the problems facing the mankind. It is therefore the duty of all those who believe in Gandhism and are followers of Mahavir, Budha, Christ and Mohammed Sahib to check this epidemic of violence. Concentrated and determined efforts to subdue this upsurge and check unsocial elements in their tendency towards violent action and encourage liberal thoughts,broad mindedness and preach communal harmony and religious toleration is the pressing need of the hour. 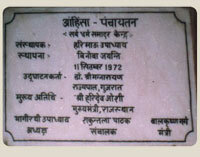 To achieve the noble objective the Ahinsa Panchaytan was established at Hatundi on 4th November 1970 by Pt. 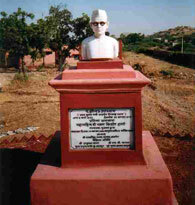 Haribhau upadhyaya. 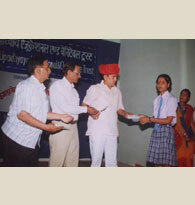 "Ahinsa Panchayatan", a compound word is a creation of Hari Bhau ji's imaginative mind. Prior to this, no one has heard it anywhere. But Hari Bhau ji is among those grandeur personalities about whom one can say in Sanskrit "Yachmarthonudhavati" i.e. the meaning of the word followed later. Usually, people first think of the meaning of a word and then use the word accordingly but there were a few ancient sages who uttered the word first and its meaning emerged later. Similarly, the word "Ahinsa Panchayatan" has been originated by Hari Bhau Upadhyaya. The purpose of this essay is to clarify the meaning of this word and establish its foundation on the basis of scriptures. My first contact with Hari Bhau ji was in 1911, about 60 years ago in Varanasi. From that time to now, this relationship has assumed several forms-- from teacher-student, best friends, coworkers etc. It has reached to the state, where it can be said that "teacher stayed as raw sugar but the student became refined sugar". Here, for publication in “Smarika", it will be appropriate to recall an incident of that time. At that time if anyone asked a question to Hari Bhau ji that he could not answer immediately, in a humorous way he will say "Why do you ask me, ask my teacher. If he cannot answer then I will". In a similar spirit, here is my unmerited attempt to explain the meaning of the word "Ahinsa Panchayatan". This gem of a word has been created by him and to decorate it is my job. In a dramatic language, I say in Sanskrit "ulmitivistereg" i.e. -----*summing up in brief---* and continue. Creation of compound words is a unique feature of Sanskrit language. By doing so, we can "fill the ocean in a pot". A compound word can have several meanings. Example is the Vedic word (Written in Veda) "Indra-Shatru" (enemy of Indra-chief of deities) is known to the experts in that field. Siddha Nath Sut (Son Of Siddha Nath) means Hari Bhau ji but when needed the same word may indicate grandfather of Hari Bhau Ji as well. The meaning of a compound word is changed by emphasis on the first or the second word. In a compound word, usually the first word is not emphasized. Accordingly, in analyzing “Ahinsa Panchayatan", first I have to analyze the word "Panchayatan". "Aayatan" word is derived from "Aa" with "Yat" which means a designated residing place e.g. Hatundi can be Hari Bhau ji's Aayatan. That word has not been seen in Rig Veda Mantras but is present in other scriptures. In later "Granth" (a literary religious book) it is present in the word "Aayatanvati Aahuti" (a designated place for offering to fire). When there is a designated place for Aahuti (offering to fire) it is called "Aayatanvati Aahuti". When the place for Aahuti (offering to fire) is not designated that Aahuti (offering to fire) is called Anayatan Aahuti (non-designated place for offering to fire). In Upanishad this word is clearly used. In Kenopnishad it is said in Sanskrit "Satypayatanam" meaning truth is final abode. After clearly understanding the meaning of word Aayatan, let us think about the word "Panch"(Five). It has not been changed from the time of Rig Vedas to the present. This word is not used alone. When compounded with another specifying word, the meaning of the whole word becomes clear by understanding the specific word it refers to. e.g. Panchagni (five fires), Panchpran (Five lives), Panch-Mahabhoot(Five great pasts) etc. Surprisingly, although both these two words "Panch and Aayatan" individually existed for a long time, the compound word "Panchayatan" was first used by Shri Shankerachrya Ji in the 8th Century A.D. This word was originated by him and today in the homes where worship ritual is performed in a Vedic manner, it is still used commonly as Panchayatan (five designated places). History of this word includes a dispute amongst religious leaders as briefly described below. Around 7-8th Century A.D., in India there was a great struggle regarding religious faiths (Dharma). Both Buddha and Jain Religions were preaching views of renunciation causing inactivity in people and a decline of Vedic view which in contrast emphasizes active participation in life (karma). Acceptance of ancient Vedic deities had declined and Vedic Dharma had fragmented into worshippers of several deities. The popular ones were Vishnu, Shiva, Sun, Ganpati (Ganesh), and Devi (Goddess). Their worshippers fought among themselves pointing out that their chosen deity was superior and ridiculed other deities. Scholarly Shri Shankerachrya ji affirmed monism and on the basis of equal respect of all he proposed a defined plan for worship. He discarded the then prevailing way and devised a new plan for which he created the word Panchayatan. In this plan, instead of the statues, the five deities were represented by stones and other objects. Vishnu was represented by a black round stone (shaligram) found in Gandki River, Ganesh by a red and Shiva by white Narmada river stones, Sun by a round piece of glass and Devi by smooth flat pieces of stones. At the center, individual's chosen main deity was placed and the other four deities were placed, one at each corner. This is how Panchayatan word was first created. Possibly after many discussions, a following plan was agreed upon: When Vishnu was the main deity, then representative of Vishnu was placed in the center and at the four designated corners named Ishanya (North East), Aagneya (South East), Naitritiya (South west) and Vyaya (North West) Shiva, Ganesh, Sun and Devi were placed. If Shiva's representative was in the center then at the above mentioned places Vishnu, Sun, Ganesh and Devi were placed. If Sun was in the center, at the four corners Shiva, Ganesh, Vishnu and Devi were placed and when Devi occupied the center location then Vishnu, Shiva, Ganesh and Sun were at the corners. This is depicted in the diagram drawn below. Due to respect for Shri Shankerachrya Ji's principle, instead of statues, formless objects as representatives of deities were accepted but still, common people, wished for statues. Therefore Geeta says in Sanskrit "Avyakyta hee gatidurkhum dehvdbhirapyte"i.e.To make progress in unmanifested is always difficult for those who are embodied. Once again proliferation of statues resumed. Word Panchayatan and its five representatives were limited to within the homes and that worship ritual still exists in some homes. Disrespect for each other was replaced by equal respect for all deities and goal of Panchayatan was achieved; however, the desire to worship god in the form of statues persisted and led to the evolution of temples. First one to exit from Panchayatan was Devi and she accompanied Shiva as Parvati, as Laxmi with Vishnu, as Saraswati with Ganesh and was worshiped at the public places in temples (mandir). She also existed as an independent individual with a name Durga. Since Sun was not accompanied by a known female, his temples were not made. For Shiva temples, Shiva Panchayatan was created by including Shiva, Parvati, Ganesh, and Skand (their two sons) and Nandishwer (Ox named Nandi- vehicle of Shiva). Vishnu's main incarnation Ram accompanied by Sita (his wife,), Laxman and Bharat (his two brothers) and Hanuman (deity in a monkey form) made Ram Panchayatan. In time, as temples became popular, Panchayatan's original essence was lost. 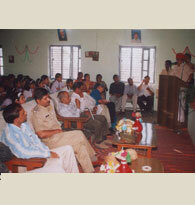 We have reached the present after tracing the history of the word Panchayatan. 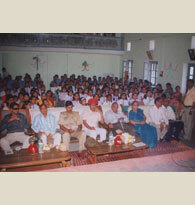 According to that "Ahinsa Panchaytan's" meaning should include Ahinsa with four complementary qualities. In this context, we should consider which four qualities are to be included. Qualities can be defined in two forms, one expresses presence of the positive characteristics and the other will be the absence of negative characteristics. Ahinsa is included in the second form. To understand the meaning of word Ahinsa first we have to know what the meaning of hinsa (violence) is. Ahinsa then will mean absence of hinsa. According to Manu in Sanskrit “Pravrttiresha bhutana but nivrittiustu mahafala"i.e. Attachment is basic nature of being but renouncing bestows enormous fruits.There are four other qualities in the second group of absence of negative characteristics. These are Asteya, Asnagrah, Aswad and Abhay (absence of downfall, absence of accumulation of materials, absence of taste and absence of fear). Thus Ahinsa is placed in the center being the main feature while the four supporting qualities are placed at each corner to form the rest of structure of Panchayatan. But Hari Bhau Ji's imagination was more than that of the fixed structure of Panchayatan. He combined all of them in one statue instead of at five different places as it is in the structure of Panchayatan. Dattatrey (a deity) is three faced with faces of Brahma, Vishnu and Shiva together in one form representing Ruj, Satya and Tum three qualities. From 1907 to 1909, I kept a copy of a picture made in the first decade of 20th century, in Maharashtra, where faces of Brahma, Vishnu and Shiva were replaced by three prominent freedom fighters Lal, Bal and Pal (Lala Rajpat Rai, Bal Krishna Gokhle and Bipin Chandra Pal). There is some similarity of that picture with Hari Bhau Ji's statue of Ahinsa Devi. 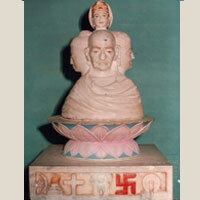 The difference is that instead of three faces, Ahinsa Devi has five faces. There is another example of five faced statue of Shiva. In five faced form of Shiva his five fierce forms Ishan, Tatpurush, Aghor, Vamdev and Sadyojat are depicted. 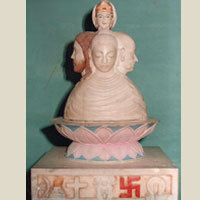 In Ahinsa Devi Statue her four faces, one in each direction, are faces of Gautam Buddha, Mahaveer, Christ and Gandhi ji and at the top there is an imaginary face of Ahinsa Devi. May Permeshwar, a form of Ahinsa itself, provide success to Hari Bhau Ji's idea and followers of all religions learn to give equal respect to all. This is my sincere wish and I end this as I bow to Ahinsa Panchayatan. Editorial By Hari Bhau Upadhyaya Our Motto "Equal respect for all"
How the feeling of equal respect originated? Although foundation of “Ahinsa Panchayatan” was centered on the idea of equal respect of all religions yet its meaning is not limited to it. In reality, I always had the feeling of equal respect for all form of lives. Its expression came in an interesting way. Many years ago, Aacharya Shri Tulsi and Muni Shri Susheel Kumar Ji were staying at the same place--- Ujjain for chatturmas. Unfortunately at that time, a discussion between them became more than argument resulting in bitterness amongst them. Then a famous astrologer and my dear friend Shri Surya Narayan Vyas wrote to me to go there and help resolve their arguments. When I started, my thought was that I am a mere public worker and how can I resolve the dispute between these distinguished personalities? Till I reached Ujjain, I was mulling it over. Suddenly, at Ratlaam railway station, an idea came to me. Both Aacharya Ji and Muni Ji were followers of Mahaveer who had suffered a lot by dedicating his life in devotion of Ahinsa (Nonviolence). I felt Aacharya ji and Muni Ji lacked mutual respect. The devotion which Mahaveer had is not seen these days but at least from the leaders of Jain religion such as them, mutual respect was to be expected. We already knew about respect for books, pen and inkpots etc. and I recalled that my mother did Namaskaar and asked for forgiveness to even a sweeping broom, if by accident, she touched it with her foot. In our culture, a tradition of respect even for the non-living objects has existed for who knows how long? Then why not request these two great famous gentle men that instead of bitter criticism and animosity, discussion should be based on mutual respect. I may start with a request for a mutual respect instead of aiming for the high unattainable principles of Ahinsa (Non violence). This thought enlightened my heart and I decided to act based on that idea when I met them. I was known to Aacharya Ji and he favored me. 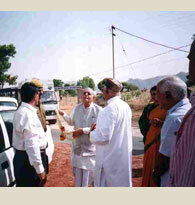 I was meeting with Muni Ji for the first time, but my experience with him was pleasant. The result of the discussion at Ujjain turned out to be good. Later, at Delhi, a conference on religions of world was attended by both of them and also their disciples, followers and other Munis. In that conference, the overall atmosphere was peaceful and respect for each other was obvious. After that, the idea of equal respect deeply settled in my heart. The principle of considering everyone a manifestation of Ishwar (God) is high and unachievable goal but if we want to move in that direction the first step is to equally respect all lives especially human life. Further progress in that direction was made when Late Shri Jawaher Lal Nehru planted the Bodhi tree here in Hatundi. Later, his daughter—our brilliant Prime Minister Smt. 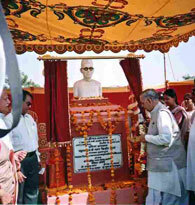 Indira Gandhi inaugurated and unveiled the Buddha's statue made in Japan. We have expressed our respects for different religions emphasizing non violence in this as Ahinsa Maata (mother non violence). This statue should inspire non violence, compassion, love, peace and friendship to all. Religious rituals like worship will not be included here as they are only superficial aspects of religion. If this does happen, our attempts will be considered successful. This is the basic idea. To convert it into action, in 1971 Jan., we celebrated Christ and Shri Vivekananda Ji’s birthdays when Aacharya Shri Tulsi along with his disciples came and wholeheartedly blessed this project. As a second step, this "Smarika" is published. To prove our point that Ahinsa Panchayatan is not just an idealistic talk, we included in "Smarika" articles regarding other current burning topics and problems of society. How our attempt pans out will be judged only by the readers. Spirituality---We believe that every living being shares the same soul is an undeniable fundamental truth. We understand that this is the foundation of love, equality, mutual respect and high ideals. 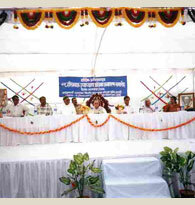 Spirituality here does not imply renouncing the world and neglecting our duties towards the society but instead of giving importance to the physical comforts when creating the new society, organizing the community or governing the nation, emphasis should be given to the strength derived from underlying universal humanity. In other words physical pleasures and comforts should not be the main focus of life, inner strength of the heart and qualities like, justice, fairness, cooperation, and public service should be high on the list. Agreement on these principles is essential. To move one step further, we should understand the power of the divine awareness, and consider our duties towards humanity, society and nation as our Dharma. This does not imply our negligence, aloofness or insult of society or world, but in an attempt to reach highest ideals, one can offer himself to the society. This is the basis which is deeply rooted in us. We consider societal need take precedence over individual interests. Consistent with our point of view of mutual respect, we respectfully include the critical comments by our friends and other reviewers below. Although we firmly believe in our above mentioned ideas, and faith in Mahaveer's principles, however, it is also possible that we have overlooked mistakes somewhere in our ideas or that the ideas of others may have truth; however we will not change our ideas till we are proven wrong. We are publishing their comments so that our readers can read them. Thus, they will not remain concealed and will become public knowledge. This is an indication that the idea of mutual respect is not just a talk, it does teach us to respect all views. 1. "I believe that nonviolence is not only for writing, thinking or reading but is to be incorporated in our actions. It is tested by the magnitude of sacrifice the believer will make by choosing nonviolence. Leaders say "I am sorry" but that will not work anymore. The young generation is restless and angry. It is fed up by sweet talk, discussion and ideas. Hope you do not feel offended." 2." Ahinsa is a way of life based on truth. Its face is love and its feet are cooperation. Yet, will you make a new mandir (temple) in the country full of mandirs (temples)? Study of teachings of Buddha, Mahaveer and Christ is extremely important but by creating a concept of "Panchayatan" are you not emphasizing view of Hinduism? It is possible that mandir (temples), masjid (mosque) and church attending people will learn tolerance and have good ideas but for how long? Till the founder of equality statue "Daa sahib" is alive? 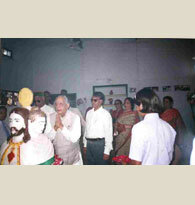 His life's essential element has been equal respect for religions and sects but will Mandir (temple) survive after him"? 3. "So that I do not keep anyone in dark, it is appropriate for me to say that there is a significant change in my thinking and ideas. You are just stuck with Ahinsa (non violence). You have asked me and some distinguished people a name regarding this. For "Ahinsa Panchayatan" today, I can give you half a dozen names. Certainly the first special name is that of respected General Yahiyakhan. Similarly several small or big names are scattered all over. This is the one more popular now. Who listens to Buddha and Christ? For thousand years these names are there but what is their effect now? Only a few sing their praise. Just to satisfy yourself at a personal level does not mean that it will move anyone forward. Bitter experiences of the world have changed my nature and view point. The mind of people, generally better than us, is split in two groups. One is spiritual and other is practical. There is no unity in them and people are satisfied in keeping them separate. Certainly you must have noticed that well known politicians, and industrialists of our country, on one hand talk well about the spirituality and non violence and therefore consider themselves as pillars of religion and on the hand do not hesitate to lie, steal, gamble and bribe in their personal lives. They do not even consider these as evil. In their spiritual part of mind they do not think it is destructive. One more point is to be mentioned. The name of the people you have mentioned and you consider them as worshipper of Ahinsa (Non violence) all ran away from the world. Both Buddha and Mahaveer told his followers not to be concerned with the worldly matters. Only those who had renounced the world could be their disciples. What benefits the worldly people can get from teaching of such representatives of God? Mahatma Gandhi was truly the one who kept himself involved in the worldly matters but you might have seen even he avoided the high talk of Ahinsa (non violence) where he had to use non violence in a practical way. For example, a murderer is generally hanged. He asks to the Governor for forgiveness. As a Governor somehow I managed first two murderers to be forgiven but later on I could not do anything. Hanging continued to exist for such individuals. After the Governor, the request for pardon goes to the President and that is where the last order is given. There is no president or will be one like President Rajendra Prasad, who followed Gandhian principles closely. He told me "In Punjab there are many ruthless murders and hanging is necessary". Certainly I will like to know if Gandhi ji were in that position what would he have done? Probably you will be surprised to know about this incident. In early 1947, at the time when Pakistan attacked Kashmir, Gandhi Ji was staying in Birla Bhawan in Delhi. One could hear the army planes flying daily. One day when planes did not fly, Ghan Shyam Das ji himself told me that Gandhiji said "Although I am a believer of non violence but I do not like that today army planes are not flying towards Kashmir." There cannot be another example of such a difference in ideology and conduct. After seeing the real world's deceitfulness, I have changed my mind. The world will keep on going. It will not be different one way or the other. 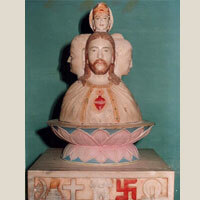 Buddha and Christ may have their famous names to be remembered, but that will have no effect on the world." Above opinion was expressed by Shri Prakash Ji on 26th May in a letter. We are very sorry to say that after a few days of this letter Shri Prakash Ji passed away. He told us that thoughts expressed in this letter may be considered as his essay for "Smarika". 4. 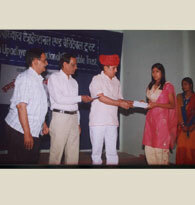 "I have read twice the introduction, title and activities of "Ahinsa Panchayatan" and your letter five times. I have thought about it thoroughly. Can we bring a useful change through this type of institution? Can these ideas stop the violent nature of this ruined society and transform it into completely new society? The answer to that in mind is No, No and No. I have a tremendous respect for you from the time of "Tyag Bhoomi" (a patriotic magazine edited by Hari Bhau Ji). I understand your desire to remain active and productive. But the practical question is: is there any possibility of achieving a useful and successful result by these activities? In my mind, I do not have a single ray of hope in this direction. In this time when statues of Ravinder Nath, Gandhi JI and Viveka Nand are being destroyed, how will you be able to keep Ahinsa Devi temple safe? In the country and society where government has ignored Gandhi JI's name, how can non violence temple be kept safe? After careful thinking, I cannot understand what is this all about? You might remember my faith in "now not the workers of political organization but only the sacrifices of lives can stop this violent blizzard of rebellion". I said whatever was in my mind. You have earned my respect. How can I not be honest with you"? Truly, today the time of cyclone is such that even the great ones sink in it. We are overwhelmed by the suffering of this friend; however; it inspired us to be more determined in efforts of our mission to be successful. 5 " I have come to this conclusion that truth and non violence are neither qualities nor principles, not even supremacy of life. Aim of life is love. Truth and nonviolence are woven into it. To give them a worth worshipping status, in a way, is to lower their values. You may know that near Vardha, in a small village there is a statue of Ahinsa and to protect its existence, a mace is placed in her hand. To convert life's aim to an idea or a desire is to insult it. Similarly to worship a principle also in a way devalues it. Like other places of worship “Ahinsa Panchayatan" will also become one of the sacred places for worship and for its protection either in a direct or indirect form battle field like Kurukshetra ( name of a battle field in an epic Maha Bharart) will be welcomed. Statue of Digmber (sub type of saints) saints have financial needs for its security and protection which requires aid from the government or armed guards. The mandir (temple) where people of all religions can freely go will also require protection. Our Aashrmas (a type of institution started by Gandhi ji where his followers lived and practiced his principles in life), legislative, and social institutions can also be considered homes for Ahinsa but today for their preservation armed guards are required. Will we be able to establish an entirely revolutionary new ideal standard for society's welfare through "Ahinsa Panchayatan"? Religious zealots bound to traditions have devalued the basic tenants of religion in an attempt to institutionalize it. The circumstances are quite strange that religious institutions have less influence than the public social institutions. Railway stations, post office and markets are accessible to all but some temples are not. Has the day not come yet when the religions do not get limited by narrow horizons but extend to the entire universe? I feel that in India there is more need for bravery than for non violence. Where there is no bravery, Ahinsa (non violence) cannot survive because its role will be less prominent, in other words second best. First preference will be for fire arms. Ahinsa (non violence) is a companion of fearlessness. Peace and bravery are twin sisters where bravery is the elder one. Where there is dependence on war equipment, there may be excellence in the art of war but not courage to win. This is the major difference between the advocates of Ahinsa (non violence)in ancient times and Gandhi ji. I do not want to compare them with Gandhi ji. Their approach may be superior but Gandhi ji's view of peace and non violence has a revolutionary element which is not an expression of armed power but of love." Violence accepted by religious, respected elites of the society and violence in order to change the society, both should be avoided and discarded; first one is not apparent, is performed in a hidden way and is reprehensible but the second one although objectionable, may be forgivable. We will have to find ways to invent active creative forms of Ahinsa (non violence) for the benefit of society. "Nanyah pantha vidyeyanam" Newly discovered ways will establish efficacy of Ahinsa (non violence). Who can say that the ideas of our respected friend do not totally shake us? Deriving inspirations and using intelligence from these and similar thoughts have given birth to some massive organizations such as Ahinsa Panchayatan, Panch Permeshwar and Gram Raj. Weattempted to give a form to the formless. After all, Permeshwar (God) also works through some form and organization. Our basic belief and faith in "Ahinsa Panchayatan" received opposite as well as concordant ideas which are published elsewhere in "Smarika". Capable and thoughtful readers have been given various ideas to think about it. They are free to accept or deny the idea of "Ahinsa Panchayatan" according to their opinions. This copy of "Smarika" is in reader's hands. We are glad that we are able to complete our mission but with heavy heart we have to confess that it could not match our initial vision. Some are due to lack of cooperation and some are due to lack of our abilities and blessings. I do think that second reason is correct as from 9th Aug I had to continuously stay at Jawaher Lal Nehru Hospital after a heart attack. I have to "endure" complete rest as advised by doctors in my this "imprisonment". Despite all the problems, this mission could be completed due to the efforts and cooperation of others but we take the responsibility for the deficiencies in it. To make others responsible for our faults and deficiencies is not appropriate and I ask for forgiveness of the readers for our deficiencies.